Welcome! We are the only Orthodox Christian parish located in Meriden or its neighboring towns, bearing witness to the fullness of the Faith first delivered by the Apostles of Jesus Christ. If you are an Orthodox Christian living in the area, we hope to see you soon. If you are searching for the purity of the Christian Faith in a world where teaching, morals, and worship shift with each passing fad, come and see for yourself what Orthodox Christianity is all about, where we unswervingly hold to the faith “once-for-all delivered to the saints” (Jude 1:3). Founded in 1911, we are a parish of the Diocese of New England in the Orthodox Church in America, under the leadership of His Eminence, Archbishop Nikon. All services are in English. People of all backgrounds are unreservedly welcome. 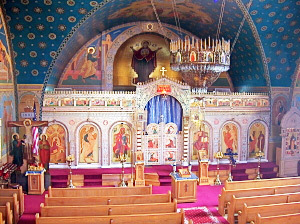 If you have never witnessed Orthodox Christian worship and know little or nothing about the Orthodox Church, please visit with us and experience it first-hand. You will receive a warm welcome.